In FY2011, revenue from hardware device sales rose 73% versus 66% revenue growth for the company as a whole and 24.2% revenue growth for software and service revenue segments. The rate of growth in iTunes revenue and revenue from other software and services sources will most likely not keep pace with the rate of growth in revenue from hardware device sales. These other sources of revenue are created to support device sales and are wholly dependent on those sales for revenue growth. They are not now nor will they become separate and independent revenue operations. The data table below delineates the average revenue per unit generated by each of Apple's major device lines in fiscal years 2011 and 2010. In FY 2011, the iPhone and Macintosh product lines had solid increases in the average revenue per unit sold on strong unit sales growth. The iPod line's average revenue per unit sold in FY 2011 was influenced by rising sales of the Apple iPod touch and falling sales of lower-priced, single-use digital music players. The iPad's decline in average revenue per unit sold was due in large part to the product line's leap in global distribution and the increased percentage of lower-priced models in the overall sales mix. As of June 6, 2011, Apple increased to $22 the revenue deferred on each Mac sold, increased to $16 the deferred revenue on each iPhone and iPad sold and increased to $11 the deferred revenue on each iPod touch sold. Apple's ability to maintain high average revenue per device sold despite growing global competition is even more impressive considering an increase in the revenue deferral on Macintosh personal computers and iOS-based devices as of June 6, 2011 to recognize the rights of device owners to make use of Apple's iCloud services. Apple considers iCloud an integral component of the device use experience. Since the opening of the iTunes music store in 2003, content and content availability for Apple devices has sparked explosive growth in device unit sales. The biggest benefits to Apple from the company's iTunes content distribution franchise is the ability to maintain device prices and provide incentives for consumers to purchase other Apple-branded products to share iTunes content across multiple devices. The sharing of iTunes content among devices purchased by the same consumer will diminish average iTunes sales per device but it will increase the revenue generated from each device owner and it provides a powerful way to differentiate Apple products from products offered by competitors. Apple's recently released iCloud service allows for the sharing of personal information across Apple-branded devices such as calendars and contacts and provides for cloud-based storage of this information. The iCloud service generates no income of its own, but similar to iTunes it provides an incentive for consumers to purchase other Apple-branded devices. The success of iTunes and iCloud is best measured by the positive impact the services have on product unit sales and increased revenue per customer through purchases of multiple Apple devices. Apple's 82.7% rise in earnings per share in FY 2011 to $27.68 was fueled in large part by 66% revenue growth based on 73% growth in revenue from device sales. It was also fueled by Apple's ability to increase gross margins due to attractive average revenue per unit sold and a diminishment in the percentage of revenue consumed by operating expenses. 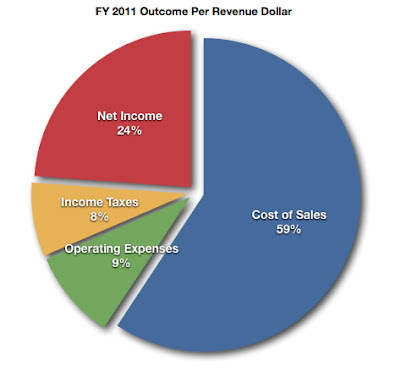 The graph below illustrates the outcome per dollar of the $108.249 billion in recognized revenue. As the graph indicates, almost 25% of each revenue dollar flowed to the net income line. 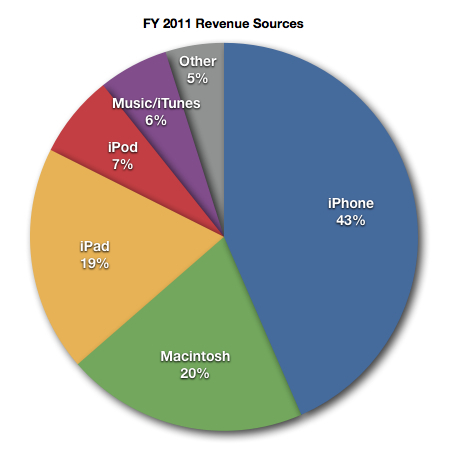 Apple achieved an average gross margin of 41% on each recognized revenue dollar in FY 2011. Apple's ability to maintain attractive average revenue per device sold and the company's ability to benefit from economies of scale as unit sales moved higher during the fiscal year, delivered outstanding gross margin results. In addition to high gross margins, the low percentage of revenue consumed by operating expenses factored heavily into "Apple's 25% solution." The Apple retail stores as sales, service, marketing and advertising centers assisted in driving operating expenses to 9% of recognized revenue. The stores also increased the company's net income by preserving the retail margin on Apple products sold through the stores. In FY 2011 the retail stores generated $14.127 billion in revenue or about 13.1% of the company's revenue total. But in the December quarter alone, the retail segment's margin exceeded $1 billion. In the September quarter, the stores sold over 1 million Macintosh computers for the first time and served as primary locations for iPhone 4S sales following the debut of the new iPhone handsets in mid-October. The presence of the retail stores as effective sales and marketing centers is highlighted by the fact 50% of Mac buyers at the retail stores are new to the platform. Of the 41% of recognized revenue represented by the company's gross margin, almost 60% flowed to the net income. Contrary to popular opinion, Apple's impressive profitability statistics aren't produced by "high product prices." Apple's impressive profitability is crafted by the company's ability to maintain product prices and control operating expenses. There's a big difference between the popular perception and the company's success reality. Apple carefully selects its product markets and the market tiers in which the company competes for sales. Apple also carefully controls the growth in operating expenses. The global network of retail stores as sales, service, marketing and advertising centers reduces the percentage of revenue consumed by sales and advertising activity. The stores are a net profit center based on the sales generated through the stores alone. Apple's revenue and earnings growth are driven exclusively by device unit sales. Other revenue sources such as iTunes and software sales are constituent to hardware device sales and are designed to provide a "value added" to the device owner's user experience. The company's ability to maintain product pricing and reduce the percentage of revenue consumed by expenses unrelated to the cost of sales are what create the company's high profitability. In forecasting Apple's global growth I watch for the location of new retail store openings, the signing of additional iPhone carriers agreements in markets in which the iPhone has been previously available and the company's cautious but steady approach to new market development. Apple could, in the short-term, produce higher overall revenue through product price capitulation and by extending product sales into new markets ahead of an established retail store presence. However, this would deteriorate the company's high net income outcome. There's no reason for the company to take those extraordinary steps when revenue growth from device unit sales remains near 75%. The September quarter's slower rate of revenue growth at 39% was due to the pending release of the iPhone 4S. No matter Apple's size as a $110 billion revenue company as of the end of FY 2011, revenue growth is driven by device sales and especially new device sales. iTunes, iCloud and all other services are designed to boost device sales and maintain product pricing. "Apple's 25% solution" is a framework for earnings growth at a pace greater than the rate of revenue growth. Efforts at revenue growth will be tempered by the company's ability to control costs and deliver strong net income growth at a pace at least commensurate with the pace of growth in revenue. It's "Apple's 25% solution" and it will continue to drive strong earnings growth in FY 2012 and beyond.